Woo stands for winning others over. You enjoy the challenge of meeting new people and getting them to like you. Strangers are rarely intimidating to you. On the contrary, strangers can be energizing. You are drawn to them. You want to learn their names, ask them questions, and find some area of common interest so that you can strike up a conversation and build rapport. Some people shy away from starting up conversations because they worry about running out of things to say. You don't. Not only are you rarely at a loss for words; you actually enjoy initiating with strangers because you derive satisfaction from breaking the ice and making a connection. Once that connection is made, you are quite happy to wrap it up and move on. There are new people to meet, new rooms to work, new crowds to mingle in. In your world there are no strangers, only friends you haven't met yet -- lots of them. Learn the names of as many people as you can. Build a card file of the people you know and add names as you become acquainted. Include a snippet of personal information -- such as their birthday, favorite color, hobby, or favorite sports team. Find the right words to explain to people that networking is part of your style. If you don't claim this theme, others might mistake it for insincerity and wonder why you are being so friendly. 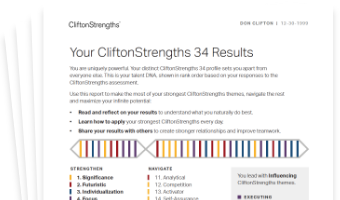 See how Woo shows in your CliftonStrengths results -- discover All 34 CliftonStrengths Themes today!